To save documents from your email (Gmail) to your Google Drive is straight to the point. Sharing documents between your email and your drive comes pretty handy when you would want some one to get access to a documents without having to go through your email. For example, you would want to share a document to a co-worker or friend or even family member that isn’t nearby, and the document location is inside of your gmail (Drafts, Inbox, Sent Messages etc). In some cases, you may not feel comfortable going the normal way of having to spill out your Gmail’s user name and also password to enable the person get access to your email and retrieve the documents where ever they are inside of the email. If you feel uncomfortable using this, old technique, due to one or two privacy issues, well, you can employ the use of Google Drive instead. So Why Google Drive? Google drive, helps you tag any thing uploaded inside of it with a shareable link. This link can be publicized to make it accessible to anyone on the web. Using this method ensures you can share whatever file or document to anyone that has the link! Thanks to Google Drive. 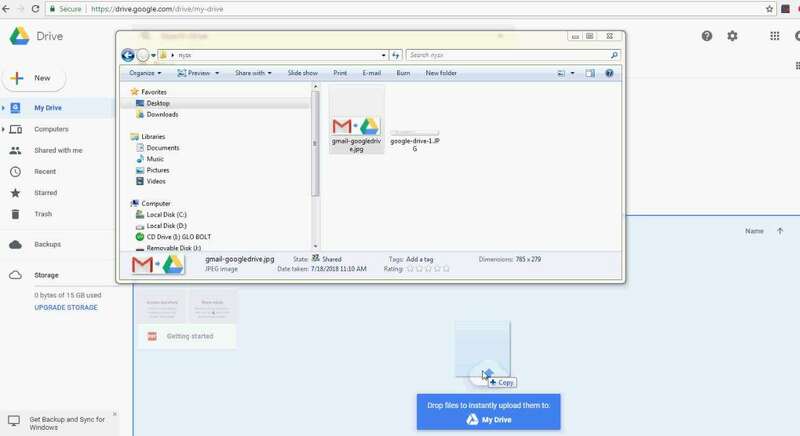 The purpose of this post is to Share with you how you can easily send your files from email to Google Drive. Before we continue let’s have a pick look at How to use Google Drive. To use Google Drive and any other Google Services out there on the web, simply, requires you to employ your Gmail Account. With this single Account you can have access to all services offered by Google. Whether it is PlayStore or Google Plus or Email or Youtube or Groups or Drive etc., all requires one single Google Account. To get access to Google Drive or any other Google Services you only need to remain logged in—–in any of Google’s services. Provided you are already logged into your Google Email. Open another tab on the URL bar of your browser, simply type into it: google.com/drive to use Google Drive. #1. First method is the browser way. Normally to upload documents to your Google Drive, is straight to the point. Once inside of your Google Drive on your Desktop Computer Browser. Simply Drag and Drop any document, file, video or archive; Depending on the file size and internet speed will determine how fast the upload will take. The second option, you can use to send files or documents to Google Drive, is to use a dedicated application. Google Drive application is available for Windows Desktop Computer or Android smartphone. The app comes with a variety of features with also ability to sync specific folders or media in real time between your device and Google Drive. The Third method is the reason for creation of this post. Here is we go below. This method usually involves sending stuffs from other sources on the Web to Google Drive. In this post we would restrict ourselves from Gmail to Google Drive instead. Click on the Google Drive icon next to the download icon. See image below. Voila! your documents is now inside Google Drive. Select option to Share to Public. A small Video Description of how to quickly get downloadable links to share your documents, files, videos, audio, archives and other stuffs via Google Drive is given below. Feel free to ask any question in the comment box below or would like a new post on another topic indicate below.